Well, it wouldn’t be an exaggeration to say a lot has happened since I last wrote, but seriously, SO MUCH HAS HAPPENED! Since we last chatted, I’ve done the following: traveled to various cities for work, got a new job, found a new place to live in Texas, quit my old job, gotten rid of almost ½ my clothes and various other things, moved out of my basement in Old Town, traveled across country in a 18ft moving truck with a car trailer, moved into an apartment in Houston, started my new job, been to Knoxville at least 2 times for my new job, established a full blown design and photography company with 5 clients in the first month, seen my family at least 4 times, and finally started focusing on what’s important in my life. So “busy”, in this case, might be an understatement… wouldn’t you agree? As I mentioned, I’ve recently started and new job and moved to a new city. This really was bittersweet for me. The unique culture that was created at my old job can never be replicated or replaced, and as much as I hated DC, I’ll miss my sweet landlords and those precious little boys, my dear friends, and more than anything, the brisk fall. Did I mention I moved to Houston and it’s 97 degrees right now? As far as work goes, I couldn’t have asked for a better transition or position. I’m excited about exploring Houston and being that much closer to friends and family. I’m eager to dine at new places, go on some fishing expeditions to the coast, head to good ol’ San Antone, spend some time at the farm, and most importantly spend more time with my loved ones. At one point during this whole transition time, I thought, ehh… maybe I’ll quit blogging for good I’m trying to build a business, just started a new job, and wanting to spend time doing things I love, no one will miss me that much… But, now that I’m settled and moved into my new apartment and new life, I’m excited to start building recipes, trying new projects, and sharing all of those things again. The only concern I have is… what will I do without my sweet Amy friend to help me out? I think it’s pretty fitting that my new adventure, and fresh start blogging… yet again, includes that sweet friend of mine’s tiny, adorable little hands, sweet heart, and wonderful help. Amy, our friend Megan, and I decided do do this “bourbon bloggin’ day” as we called it quite a long time ago, so I’m gonna admit, these photos and these recipes are from over 6 months ago, but somehow it seems like they’re the perfect start to kick off my new adventure. 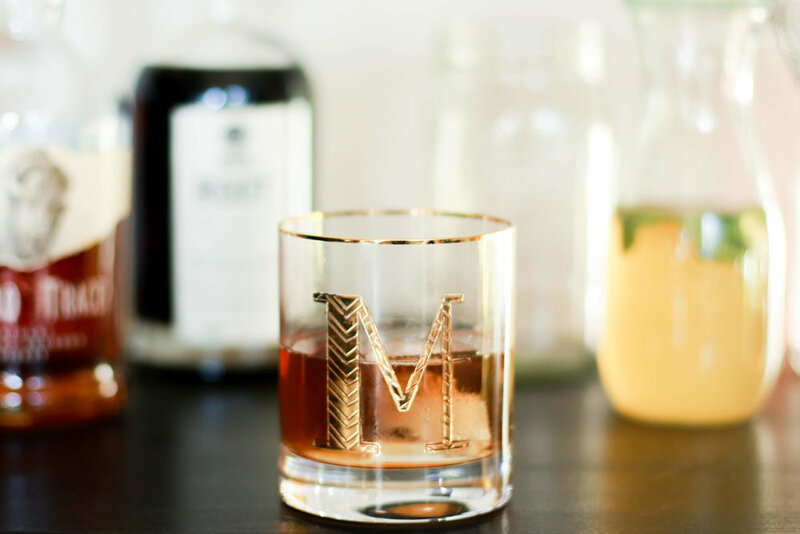 A bourbon filled afternoon, doesn’t that sound like a dream? If you know me, you know I like bourbon. I like it in the winter, I like it in the summer, I like it at all times. My ultimate Americana vacation would be a trip to Kentucky to get my name on a bat at the Louisville slugger factory and to hitch a ride along the Bourbon Trail sippin’ and tasting that sweet Kentucky whiskey. Amy, Megan, and I didn’t hit the Bourbon Trail, but we did have a glorious afternoon filled with bourbon cocktail recipe tastings, a bourbon inspired playlist, readings from familiar blogs, dating stories new and old, our squad goals, memorable quotes, and a lot of laughs. There’s just something so romantic about a cocktail that makes an evening (or afternoon) all the more glamorous. There are a lot of theories out there about where the cocktail came from and where it got its name, but one thing is certain, whoever it was, wherever it was, and for whatever reason it was, I'm sure glad they decided to put together this blend of spirits, sugar, bitters, fruit, and the like. Our bourbon cocktail recipes took inspiration from some classic cocktails, an Old Fashioned, a Smash, a Sour, and a classic from the prohibition, a Bee’s Knees. Now, I love a good Old Fashioned, and there’s not much that can be improved upon, however, every once in a while it’s nice to change it up a bit, and our change was the addition of Root, an addition inspired by one of my favorite San Antonio restaurants, Cured, this Bourbon Root Old Fashioned is perfect for those late summer, early fall days. For the Sour, we decided to add a little bit of blood orange juice, giving it a color that can only be described as dazzling, you’ll definitely want to make this Blood Orange Bourbon Sour when they come in season. The Smash was the frilliest of the drinks with strawberries as the base, making the Strawberry Smash a great spring or summer cocktail. Last, but not least, the overwhelming favorite was our twist on the Bee’s Knees. 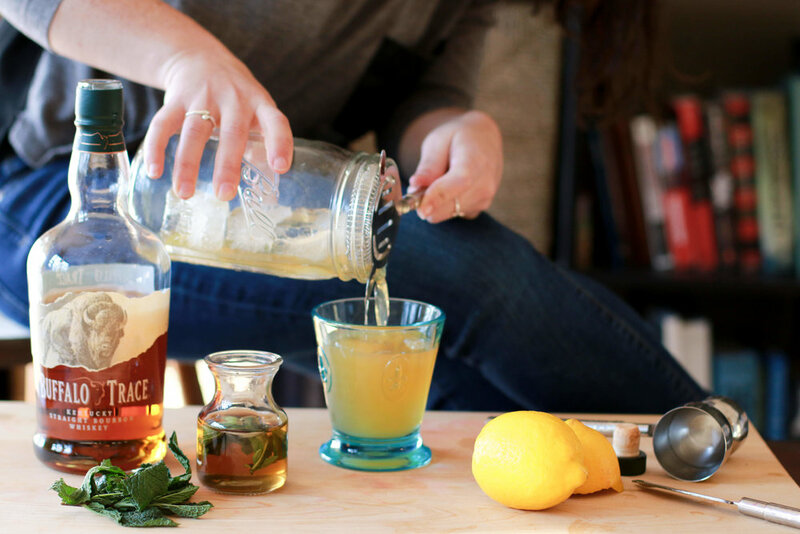 Typically, a gin drink, the combination of lemon and bourbon make for a surprisingly delicious combination that can be enjoyed year round, it truly was the “bee’s knees”. A crucial thing in cocktail making is the ingredient choice. You have to have a bourbon you like, and flavors that compliment. Since we were giving our classic cocktails a twist, we decided to give our simple syrups a little extra oomph with some additional flavor. We ended up making 4 different simple syrups for these 4 bourbon cocktail recipes. Using 2 main base syrups, we infused them with flavors like basil, mint, and cherry vanilla; the first was a syrup made with brown sugar which added a layer of depth, and the second was made with honey. Simple syrups are so easy, and keep for so long, they’re great to make and keep in the fridge for cocktails, mocktails, coffees, and teas. To infuse your simple syrups just add the flavors you’re going for after you pull the water and sugar mixture from the heat. Place all the ingredients into a saucepan and bring to a boil for 5 to 7 minutes. To make the Cherry Vanilla Brown Sugar Simple Syrup pour your hot syrup mixture over some preserved cherries and 1 to 2 vanilla bean pods. Cap the containers, and let sit overnight or up to 1 week. Vanilla bean pods can be expensive, so if you're not wanting to spend the big bucks, just a 1 to 2 teaspoons of vanilla. To make the Basil Brown Sugar Simple Syrup, simply pour the hot syrup mixture over a handful of fresh basil. After about 30 minutes, remove the basil. Once the simple syrup is cooled, you can add some fresh green basil to your jar for aesthetics. Place the ingredients into a saucepan and bring to a boil for 5 to 7 minutes. 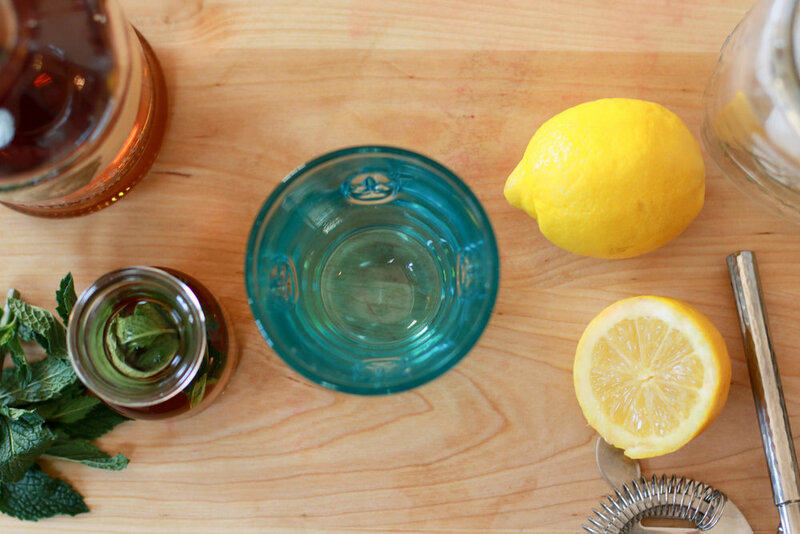 To make the Honey Mint Simple Syrup, simply pour the hot syrup mixture over a handful of mint leaves. After about 30 minutes, remove the mint. Once the simple syrup is cooled, you can add some fresh green mint leaves to your jar for aesthetics. Now, let’s get to the drinks. Have fun with these, and let me know how you put your own spin on these bourbon cocktail recipes. Modern taste on a timeless classic. 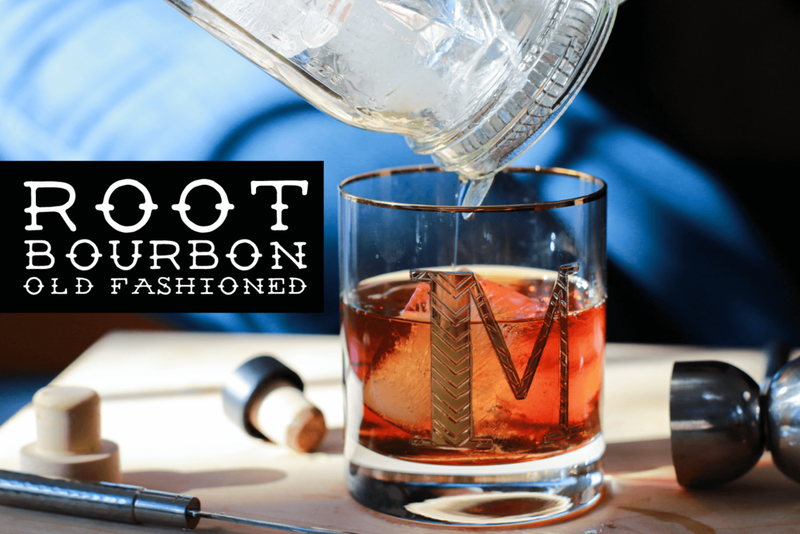 This Root Bourbon Old Fashioned features Art in the Age's Root Organic Liqueur and Cherry Vanilla Simple Syrup. Pour the ingredients over ice, stir, and enjoy. Colorful cocktail you'll want to make from December to May. 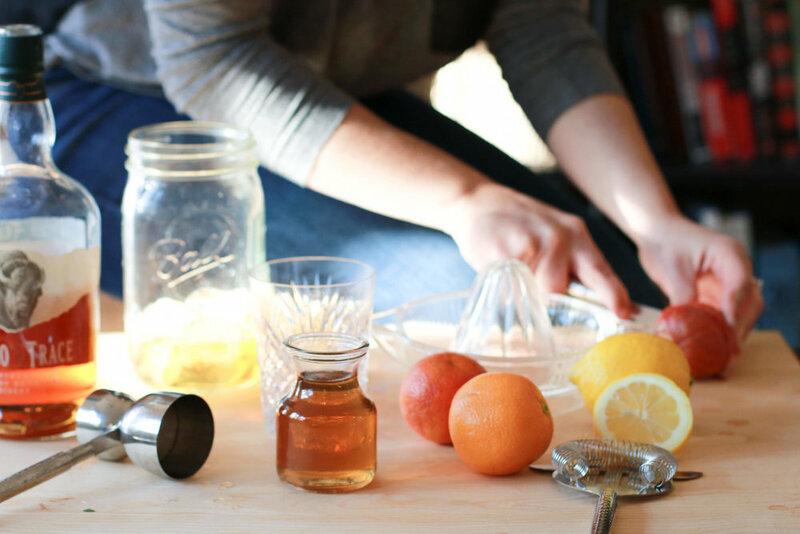 This Blood Orange Bourbon features the most elegant citrus. Feminine, fresh and delicate. This Strawberry Smash features Basil Brown Sugar Simple Syrup. Muddle the strawberries, basil, and lemon juice. Add bourbon, simple syrup, and ice. Stir, strain, and garnish with fresh strawberries or basil. Lives up to its name. 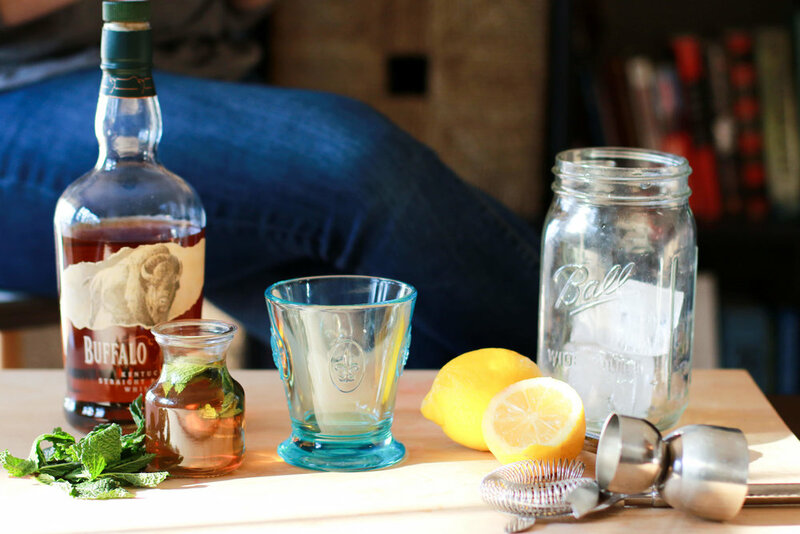 This prohibition gin classic is totally refreshed with bourbon and mint.